This could fall under the tag of ‘eye surgery‘ but it was more of a casual joke than anything that turned into a joke on me. Last week I was speaking with Gord and jested that I would buy CanSeanSeeYet.com and have it similar to IsItChristmas.com or IsMacTFired.com. Gord talked common sense into me, got me off the ledge and basically said that registering a domain for a joke “3 people will get” was a waste. I thought it was a fair argument and that it was impulsive on my part. I gave up my quest for this joke site and did not think about it after that. Wednesday morning I was renewing another joke domain, IReallyLoveTheMcRib.com. I selected the domain and went through the checkout process for renewal. I must have been too busy making sure no other GoDaddy ‘upgrades’ made their way into my cart to really see what I was buying. I completed the purchase without error, however when I received an email notice thanking me for purchasing a new domain I realized something was wrong. I went back to my domain manager and saw the horror! I had purchased CanSeanSeeYet.com without realizing it. CanSeanSeeYet.com was still in my cart from last week and I purchased that instead of renewing my intended domain. I had already paid a years domain registration for it so I might as well make the most of it. 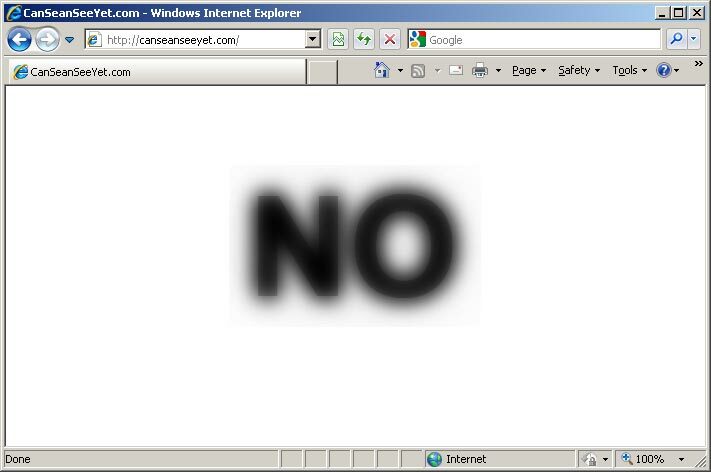 I present to you: CanSeanSeeYet.com, in all of its blurry glory.